We are looking for people to become volunteer Ombudsmen in Onondaga, Cayuga, Oswego, and Cortland counties. 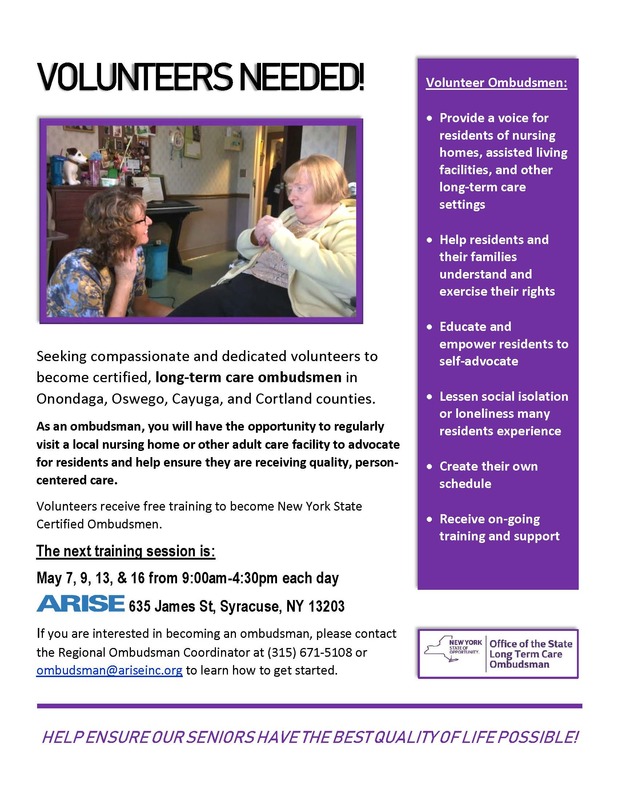 Ombudsmen are trained and certified volunteer advocates who are passionate about the well-being of people living in nursing homes or adult care facilities. They can help resolve complaints, provide information about the rights of people in long-term care facilities, and they advocate on behalf of those individuals for high standards of quality care. We have an Ombudsman training coming up on May 7, 9, 13, & 16, 2019 from 9:00AM – 4:30PM each day. If you are interested in becoming an Ombudsman, please contact Jeff Parker at jparker@ariseinc.org.